I always thought Texas A&M was the school that was full of pride and tradition? Maybe I was wrong, or maybe Texas A&M is suffering from some form of bizarre identity crisis. Texas A&M has never really had a unique or distinguishing football uniform. Football programs like Michigan, Notre Dame, Penn State, Alabama, and Texas are regularly singled out as teams with “traditional” uniforms that are “classic” and never undergo any serious changes or alterations. 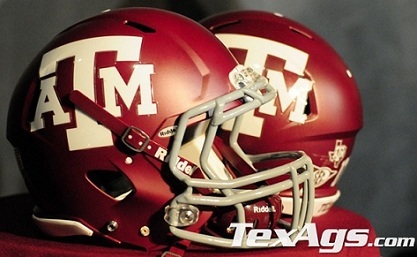 However, with all the traditions Texas A&M has, its funny that having a classic football uniform isn’t one of them. Having said this, last week Texas A&M unveiled its new football uniformsfrom Adidas. At first glance, I thought they were horrible, but they are growing on me (slowly). I don’t think I will like them more than any of the previous uniforms A&M has had. For example, in 2011 the uniform A&M wore was fairly simple while these new uniforms are a little more on the gaudy side. I know that teams want to “play to recruits” in terms of what high school kids think make for cool uniforms, but does A&M really need all of this? You would think that the newly-joined SEC would be enough to sell just about anyone. Apparently not. 1970′s Uniforms vs. Now – Not a bad idea but I think the arm stripes are what I dislike the most. Haven’t we spent the past 3 decades trying to forget the style choices that were made in the 70′s? I could sit here all day and draw parallels between what A&M is doing and what other programs are doing. I won’t, but I will point out that Penn State isn’t making any drastic changes in order to sell its program (despite all the controversy that currently surrounds it). No, apparently Penn State is going to stick with selling the same identity (uniform included) that it has sold for close to 50+ years. It all comes down to personal preferences. I, personally, prefer traditional and classic looking uniforms. Not everyone else does. Of course I was curious about one thing that hopefully someone at A&M can answer for me. I always thought A&M didn’t have cheerleaders(?). At the uniform unveiling, there appeared to be cheerleaders leading the football players/models down the stairs and up to the stage. [See video at about 2:36 mark]. The only answer I can think of is that more things are changing at Texas A&M than just the conference and football uniforms. This entry was posted in SEC, Texas A&M, Uniforms by Travis Normand. Bookmark the permalink. Good article. I’m not sold on the look at all. I think it might the the matted finish that has me scratching my head.